While nos. 11-25 of the boy’s names were dominated by names of Biblical origin, the story is very different — and much more eclectic — for girl’s names. In nos. 11-25, we have but one name of Biblical origin — but it shows up in two varieties. Elizabeth (no. 13) has long been a classic, coming to dominance in the 13th C (though it was used before then) and never really falling out. Nowadays, Lily (no. 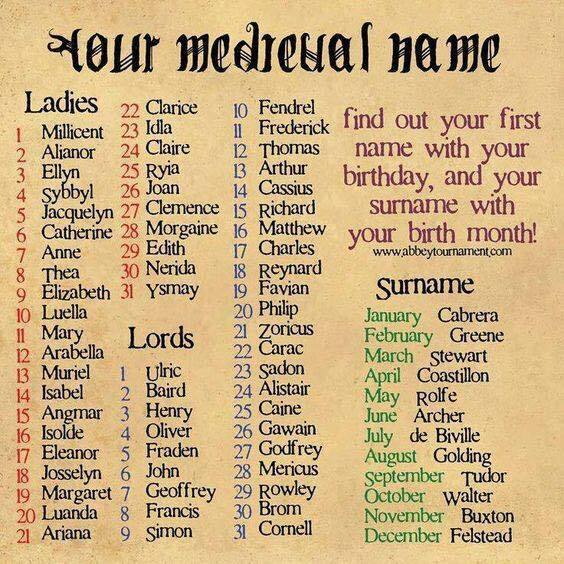 25) is generally assumed to be a flower name, but medievally, it was an English nickname of Elizabeth. Three names are of Greek origin. We’ve seen Sofia (no. 14) before, but in a different spelling. The -ph- is closer to the original Greek, while the -f- spelling shows Latin influence (it was this spelling that became the preferred spelling in Italy and Iberia). Chloe (no. 17) is an epithet of the goddess Demeter, but it was also used as an ordinary personal name. There is a New Testament character named Chloe, and her name is spelled Cloe in the Wycliffite translation of 1395. We haven’t found any medieval examples of the name but would not be surprised to see it amongst Protestants in the 16th C. Zoey (no. 23) is a variant of Zoe, from Greek ζωή ‘life’. Zoe was the name of an early Christian saint, but it was primarily used in Byzantine (Greek) contexts (it didn’t enter England until the 1850s). We haven’t yet explored many Greek sources, so we don’t yet have any examples, but we would not be surprised to! Three names in this group are Germanic. The first, Amelia (no. 12), is often connected with the Latin gens Aemilius, but though the two names were early confused and conflated, they are of different origin. Amelia derives from the element *amal, and could have been used as a nickname of any compound name beginning with Amal-. The name can be found in Germany, the Low Countries, and France in the Middle Ages, in various spellings. In the top 10 we saw Ava, which in that form is relatively rare medievally. Its diminutive forms, which include Evelyn (no. 15), were vastly more common — though one of the most common medieval spellings, Avelin or Aveline, doesn’t appear in the US top 1000 at all! Ella (no. 18) is a curiously little name, when it comes to medieval usage. It’s one of those names that sounds like it should be a well-used classic, and yet, it is surprisingly rare. It was used in England from the Norman Conquest until the 14th century, as well as in Germany, but its real popularity dates to its revival by the Pre-Raphaelites. We next move onto the names which are best classified as French: It is not that they were ultimately French in origin (both are of Germanic roots rather than Latin) but that these particularly spellings are uniquely French. Both names are also originally masculine names, having transferred to feminine usage only recently: Avery (no. 16) and Aubrey (no. 21). Avery is a French form of the name that is more standardly Alfred in English. The Alf- element became first Auv- and then Av- in French, while -frid or -fred became -frey and then -fry. The root of Aubrey is Alberich, with again the Alb- element mutating into Aub- in French, and -rich becoming -r(e)y (in the same way that German Heinrich became English and French Henry). These names were not used by women before modern times (though feminine forms of both can be found in medieval France, Auverée and Auberée). Three of the names are surnames, two of them patronymic and one descriptive. Madison (no. 11) and its rhyming partner Addison (no. 24) are ‘son of Mathie’ (a pet form of Matthew) or occasionally ‘son of Maddy’ (a diminutive of Mathilda or Maud) and ‘son of Addy (a pet form of Adam), respectively. These surnames are both English, and can be found from the 13th C on. Scarlett (no. 22) is also a surname in origin, deriving from Old French escarlate ‘scarlet’. Scarlet was not only a color but the name of a rich, sumptuous cloth of that color, and an ‘escarlate’ was someone who traded this cloth. The surname is established in England from the 12th C on. We finally have two names from Latin: We include Grace (no. 19) here because the ultimate root of the name is Latin gratia. The name was not common in England until the 16th C, but other variants — such as Gratia itself — can be found on the continent earlier. The other, Victoria (no. 20), was the name of some 3rd and 4th C martyrs, but they were not enough to push the name into common use; examples are quite rare before the 16th C.